This camp teaches kids that there is a world of adventure and experiences waiting for them and with a little guidance, they will now have the ability to start their lifetime of outdoor adventures." Working in partnership with the Alaska Department of Fish & Game, the Outdoor Heritage Foundation has been able to help expand offerings of outdoor skills classes available to young Alaskans. 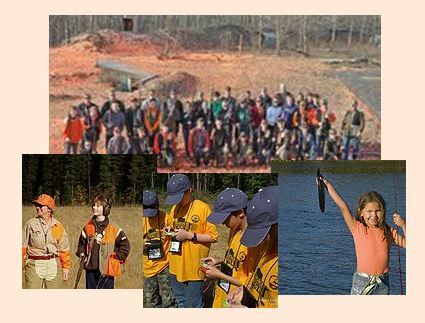 From the Alaska Conservation Camp in Fairbanks to the youth shooting league in Homer, the OHFA has been working hard to introduce your youth to the wonders and opportunities provided by an active outdoor lifestyle. Alaska Outdoor Kids! (A-OK!) encompasses many programs that teach children a multitude of outdoor skills and encourages them to get out there and use them. Getting kids outdoors and active has been recognized by leading medical experts as well as others as evidenced by such programs as "Let's Move" and the NFL's "Play 60". 1. To develop an awareness of, appreciation for, and familiarity with the natural environment, including natural resource conservation methods. 2. To foster a lifetime awareness and appreciation of hunting, fishing, and related outdoor skills and activities. 3. To successfully complete requirements of the ADF&G Basic Hunter Education course. 4. To promote independence and increased confidence in their outdor sills, and to foster outdoor leadership skills.